I've seen more than my share of movies in which crusty old misanthropes have children unwittingly thrust upon them, leading to some saccharine, life affirming conclusion. Although on the surface OCTUBRE looks like yet another of these films, it is not. There is nothing saccharine about it, and while I suppose the movie does end on a positive note, it's so subtle that you're almost not sure what happened. Clemente (Bruno Odar) is a low rent pawn broker/loan shark who has a taste for prostitutes. Despite his predilections, Clemente does not appear to be fond of using protection. As a result, he winds up coming home one night to find that a baby girl has been left at his house. He tries to act as if he has no connection to the infant, telling people that he found the baby on the streets and has saved its life, but it's almost certain the child is his. Meanwhile, he's busy searching for the little girl's mother so he can be rid of this unwanted burden. Clemente's neighbor Sofia (Gabriela Velásquez) is a lonely spinster and highly religious woman who is especially devoted to the Lord of Miracles, who is celebrated during the month of October. She recognizes that Clemente is not capable of taking care of the baby, and offers to help (for a price). But the longer she helps, the more she begins to feel for Clemente, and tries to establish a real emotional connection with the man. That's something that could really take a miracle. The direction by brothers Daniel and Diego Vega Vidal is very assured for first time filmmakers, and there are a number of very nicely composed shots. I also like the way they write their characters. Sofia is not your stereotypical devout believer. She isn't sanctimonious, and she isn't afraid to give in to her own earthly desires. Nor is Clemente your average curmudgeon just waiting for a baby to come along and melt the ice around his heart. There's hope for the guy to get in touch with his emotions, but it isn't going to be that easy. 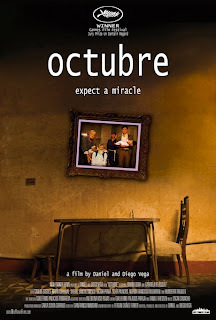 OCTUBRE is an extremely dry film that avoids most of the clichés one expects to find in movies of this type, so don't expect any cutesy scenes in which the baby pees on Clemente's shirt for cheap laughs. 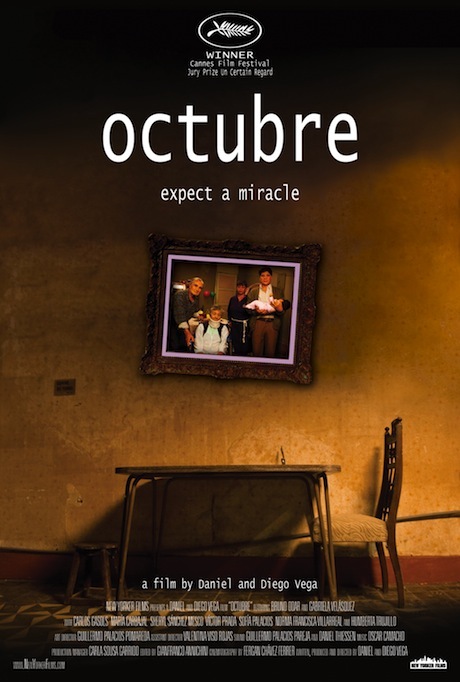 While I certainly appreciate that, OCTUBRE may be too deadpan for its own good. The tone does a good job of mirroring its protagonist's mental and emotional state, but it makes it difficult for the audience to connect. Still, a respectable debut for the Vega Vidal brothers that bodes well for future endeavors. 3 out of 4 stars.